There are, as I've argued before, many more important expressions of democratic involvement than voting. 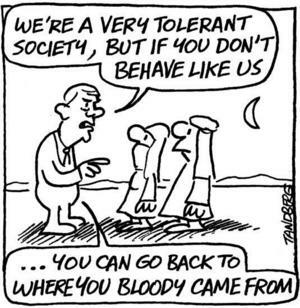 There are inherent dangers in placing our limited reserves of hope and energy into handing politics over to a professional class - one that has repeatedly sought to maintain the status quo - and then blindly legitimising their control over our lives by turning up at a polling booth every few years. That's why I feel distinctly underwhelmed by the confirmation yesterday that a referendum will be held in May to tinker with the way we choose between competing Westminster professionals. At least, tactically, a genuine proportional representation system might allow more space for voices from beyond the mainstream. But the proposed Alternative Voting (AV) system isn't genuinely proportionate. Instant run-off voting is designed to make the current 'first-past-the-post' system seem more acceptable but like all elections where the winner takes all, it only creates the false impression of majority support. In fact, AV is more likely to squeeze out any minority parties, reduce the impact of protest votes and reinforce the blandness of political debate. Even commentators like Martin Kettle in the Guardian, who is supporting the Yes campaign, acknowledges that AV is a system that no-one supports. But it was central to the Coalition negotiations last May, "the prize that finally persuaded the Lib Dems they could go in with David Cameron." Politically, this leads to an obvious conclusion for those of us who don't much care which of the mainstream parties stand to gain or lose from AV. The outcome of the referendum will, one way or another, have an impact on the increasingly fragile bonds between the two governing parties. A 'Yes' vote will strengthen the Coalition whilst voting 'No' against a voting system that isn't proportionate and that no-one supports may help to break it. So perhaps, for once, there's a reason for voting in this one after all. The arguments put forward by the No 2 AV campaign may represent a reactionary endorsement of the current electoral system, but the same isn't necessarily true of every individual 'No' vote. Rejection of AV can also represent a deliberate act of mischief, a considered rejection of Tory attempts to buy the complicity of Clegg's Lib Dems in their destruction of public services. So finally. I've waited eight months for what the surgeon at the Royal London hospital has said should be the last operation to fix the damage to my shoulder, which was shattered in a collision with a car in March 2010 as I cycled home from a Climate Camp meeting. By the this time tomorrow, I'll be pacing around a hospital waiting room, hoping there aren't too many delays. The past weekend has been thoroughly disjointed; trying not to think about how many things have been left unfinished at work and reminding myself that nightmares are just... an over-active imagination, nothing more. On Saturday I also had an indication of what to expect if the surgery fails to significantly improve the mobility of my useless left arm. Some weeks ago, using cash saved over the last year from rarely going out, I bought an a big comfy armchair, the first piece of furniture I've purchased since I moved in 14 years ago. In the morning it arrived, two days late, but the specific instructions about my inability to help carry anything up two flights of stairs had not been passed on. It didn't help that the attitude of the driver (a Scouser) was so defensive, making it quite clear it was obviously my fault and certainly not his. It was a horrible reminder of what I may be forced to expect in future: complete dependence on the incompetence of others and an inability to easily adapt to difficult circumstances. It's hard to imagine what disability is like until it's experienced first hard. Neither was it the best idea to go and see Never Let Me Go, an immensely sad, dystopian parallel-world drama where cloned children are raised so they can be harvested for their organs. Not for the presence of the notoriously wooden Keira 'Ikea' Knightley - who was actually quite good, or at least refrained more from confusing pouting with acting. - but because of the hospital scenes where characters discussed how long they had left before 'completion'. Nobody likes reminding of their mortality and I was squirming in my seat as two of the main characters limped in discomfort around hospital corridors and were wheeled into operating theatres for the last time. It's definitely worth seeing - but probably not 48 hours before surgery. So finally. From tomorrow, I won't be updating this blog for a little while but all being well, I hope to be back in about a week's time. My Mum and Dad are staying over at my flat, so at least it will be spotless by the time I return home. And I may - eventually - be able to sit down and write in a big comfy chair, if the damned thing is ever delivered. The Royal London rang to say my operation has been cancelled. I'm gutted. 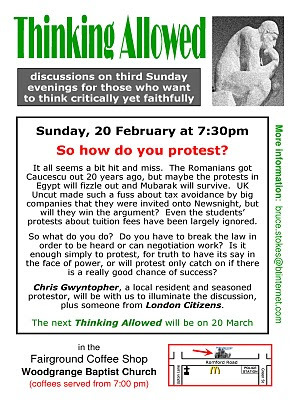 Although I'm an atheist, I was invited to take part in this interesting debate on effective protesting organised by Thinking Allowed, the monthly faith-based discussion group in Newham. I would have loved to have attended but unfortunately I'll have just been discharged from hospital and can't make it. 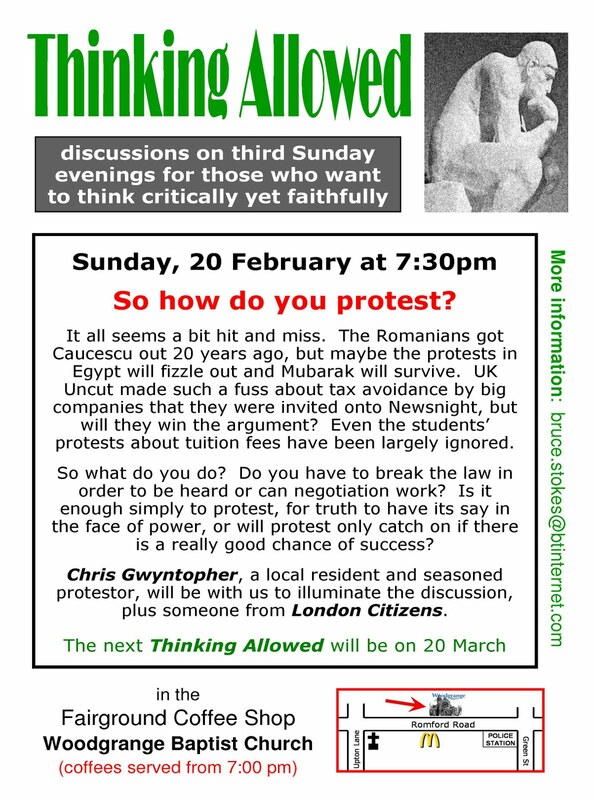 However, if anyone is interested, it takes place on Sunday 20 February at 7.30pm at Woodgrange Baptist Church, 345 Romford Road, Forest Gate and includes contributions from London Citizens and my neighbour Chris Gwyntopher from East London Against Arms Fairs (ELAAF). It is understood that key figures on the OPLC board feel that only West Ham's bid fulfils the five criteria laid out in the tender document. And while [OPLC chair Margaret Ford] has insisted they will judge purely on those five criteria, others raised the emotional stakes. Interventions by the likes of Lord Coe and the IAAF president Lamine Diack, who said Britain's reputation would be trashed if the stadium was demolished, raised the political temperature. It became clear that neither the coalition government – who view the London Games as a potential turning point in their first term – nor London's mayor, Boris Johnson,, shortly facing his own battle at the ballot box, would want to become known for ordering the wrecking balls to go in weeks after the closing ceremony. Meanwhile on Saturday, West Ham will continue their increasingly desperate attempt to become only the second club to stay up after being bottom of the Barclays Premier League on Christmas Day, with an away game against West Brom. At least they'll have one full season to try and avoid bankruptcy and clamber back into the Premiership before the keys to their new stadium are handed over. Activists really like the idea of solidarity, but it's easier to confidently talk about than to put into practice. How, for instance, is it possible to build and sustain solidarity without a common past, a collective memory? Without one it’s as if we’re always drawing a line under previous experience, resetting the clock to zero, starting afresh and then learning nothing. Sometimes this is just very frustrating: the way, for example, that despite all the noise and fury that followed the death of Ian Tomlinson at the G20 protests in April 2009, his grieving family has been all but forgotten about after less than two years; or the impression given by some rightly-indignant student protesters at the end of last year that ‘kettling’ was something new and had been specially dreamt up by the police to frustrate their demonstrations. This lack of collective memory about previous campaigns and protests is clearly something we all share some responsible for, but completely clueless indifference to any sense of a common past is far worse than frustrating, it’s completely infuriating – and it was the people behind the much-publicised ‘protest app’ Sukey who made my blood boil yesterday. 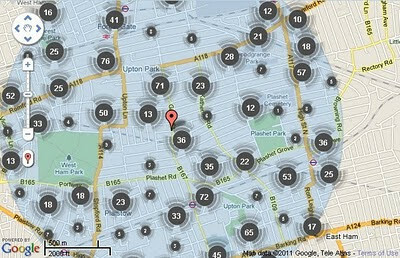 Sukey is a clever idea – an online tool designed to “provide peaceful protesters with up to date protest news”. But in an ill-judged response to a largely meaningless ‘progress report’ on public order policing issued yesterday by the Inspectorate of Constabulary, which offers the far from startling revelation that the police are struggling to adapt to the growing ingenuity and internet-savvy of protesters, Sukey’s creators circulated a truly bizarre press release yesterday morning. Using language seemingly lifted from the navel-gazing personal therapy movement, it offered to step in to help with delays in extra training for front-line officers by providing (this is not made up) “a safe room in which protesters and the police can meet as equals and work together to enable peaceful protest by sharing information openly and honestly”. It went on to claim that Sukey “coincides entirely with the police goal of preserving public order” and that, apparently, “the best way to prevent trouble on the streets is to restore faith in the ballot box and to restore faith in the police”. Where on earth did this happy-clappy drivel come from, if not ignorance of anything that happened before the student protests in November? It’s only possible to still see confrontation between police and protesters as largely a ‘failure to communicate’ if you ignore heavy-handed containment tactics, unrestrained brutality and unwarranted surveillance at the G20, Gaza and Kingsnorth protests, or any number of other demonstrations over the last decade. How else would anyone think that protesters can ever realistically ‘meet as equals’ with a massive, conservative and powerful state institution that can legally use force and coercion? How would you not know that “sharing information openly and honestly” isn’t always in protesters’ best interests If this closes down their ability to manoeuvre or that where it has been tried before (by Climate Camp at Bishopsgate, for instance), it has been the police who have broken their word? There are a few – a very few – who take part in protests simply to fight with (and get arrested by) the police, but their presence isn’t a reason to try and naively appeal to both sides of the divide. After all, clever online tools like Sukey are supposed to benefit demonstrators and would be completely unnecessary if the police thought it important to keep their promises to ‘learn the lessons’ after their tactics have been repeatedly challenged in court and in the media. Moreover, the interests and goals of the police and of protesters at a demonstration never ‘coincide entirely’ – and to imply otherwise is a failure to wholeheartedly take sides with those who hold the least power. Evidently I wasn’t the only one who was appalled today – the press release was subsequently retracted and replaced with a substantial (and less fluffy) rewording, although with all the disingenuous wriggling of a professional spin-doctor, Sukey’s Twitter feed claimed that their statement had simply been ‘clarified’. By then, it made already made its way into hundreds of e-mail inboxes and can still be read online. All of which has made me seriously reconsider using the Sukey app. I wonder whether I really want to share my location details on Google Latitude with people who may be technically brilliant but whose political judgement – and sense of solidarity – seems incredibly immature. There's a report in today's Independent about the problems facing Kamel Khichane, the manager of Café Olympic on West Ham Lane in Stratford. 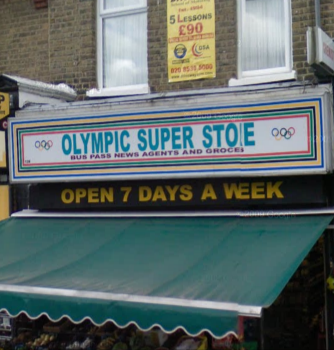 Despite seeking prior advice from Newham council, he has fallen foul of the incredibly strict rules included within the "Olympic Symbol etc. (Protection) Act" passed in 1995, which restricts the use of the Olympic symbol and certain "protected words". The café may be forced to change its name, at an estimated cost of three grand. The experience of the Café Olympic is only the first skirmish in what may become a far more wide-ranging clampdown as the Games grows ever closer. 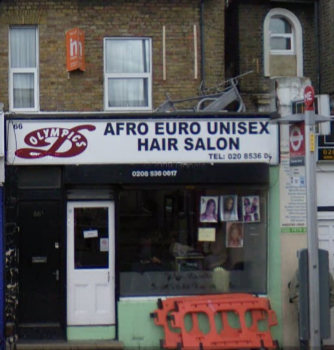 However, it's not just business owners like the Olympic Hair Salon in Leyton, the Olympic Superstore on Cann Hall Road or even the new Olympus Hotel in Stratford, with its torch logo, that should worry. Strict advertising regulations contained in the London Olympic Games and Paralympic Games Act 2006, which aim to secure compliance with obligations imposed on London as a host city by the International Olympic Committee (IOC), may have an impact on campaigners too. Crucially, the Act allows the government to regulate "advertising of any kind" in the vicinity of London Olympic events, even leaflets, posters, announcements or notices of "a non-commercial nature". This includes "the distribution or provision of documents or articles" and "material which has or may have purposes or uses other than as an advertisement". The could apply to leaflets handed out by anyone campaigning for the Games to give greater consideration for the concerns of local people about the Olympic legacy. Equally, although they're harder to bump into than they once were, it could pose a few problems for far-left newspaper sellers in the Stratford area in 2012. Ludicrously, it could also mean that if anyone decided to hand out photocopies of a newspaper article or an academic paper that is critical of the cost of the Olympics, or that discusses corruption within the IOC, then a police officer who thinks is 'reasonable' can enter their premises to "remove, destroy, conceal or erase any infringing article" - whilst holding the power to "use, or authorise the use of, reasonable force for the purpose of taking action". Let the dawn raids begin! 54. We welcome the unequivocal assurance by the Government that the long-standing rights of free expression and freedom to protest peacefully in the UK will not be suspended because of the Olympic Games. We recommend that the Government, both in the run-up to the Games and during the Games themselves, should firmly resist any pressure that may be applied by certain foreign governments to curtail the rights of freedom of expression and freedom to protest peacefully in the UK. Parliamentarians are concerned that repression bearing any similarities to the Games in Beijing in 2008 might damage "British culture and values at home and abroad" - as indeed it might! Richard has his tongue so far down the back of Jeremy's trousers he could forge a career as the back end of a pantomime horse. His attempt to foster some Clarkson-like maverick status with his "edgy" humour is truly tragic. He reminds you of the squirt at school as he hangs round Clarkson the bully, as if to say, "I'm with him". Meanwhile, James May stands at the back holding their coats as they beat up the boy with the stutter. Exactly... although by far the most comprehensive demolition of Clarkson and his eager minions comes from Stewart Lee. I'm really pleased to see that Stewart will be at Stratford Circus on Sunday 19 June to talk about his excellent book How I Escaped My Certain Fate. This afternoon, the family of Ian Tomlinson, the newspaper seller who died after being stuck by a police officer whilst passing by the G20 protests in the City of London on 1 April 2009, gathered at the spot on Cornhill where he collapsed. They left flowers and a poem to mark what would have been Ian's 49th birthday tomorrow. The G20 protests of April 2009 have now largely been forgotten and after a brief wave of anger about his death, it seems that so too has Ian Tomlinson, the newspaper vendor who collapsed and died on his way home from work after a violent assault by a Metropolitan police riot officer. But two years on, with his inquest approaching in March, Ian's family continue to live with the aftermath of death and on Monday they would have would have been celebrating his 49th birthday. On Sunday at 1pm, they plan to lay flowers at the spot where he died on Cornhill in London EC3 and are asking friends and supporters to come along and join in paying their respects. The Great Helmsman has been branching out: today Sir Robin Wales has an article on the Labour-supporting 'evidence-based' website Left Foot Forward where he tries to explain why cuts in Newham are all the government's fault and really nothing to do with him. The Dear Leader quite rightly attacks the "manifest dishonesty ministers have employed in their presentation of how much they are cutting out of our budgets". He targets Parliamentary Under Secretary of State for Communities Bob Neill for claiming that Newham faces an 8.8% cut in Revenue Spending Power’, saying that this "'masked the fact that this year we will receive £43.7 million less from central government, which is in fact a cut of almost 14% of the total". But this isn't the whole story and Sir Robin should perhaps have thought twice before arguing that "politicians present figures in a way that works for them". What the article doesn't say is what is contained in the 'Comprehensive Spending Review impacts' document [PDF] that was presented to the council in November last year. 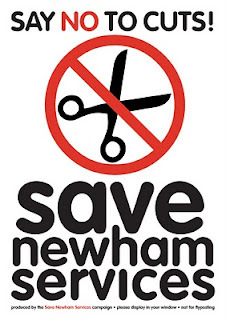 This shows that between 2008-2011, Newham council had already made £67 million in cuts to local services (failing to meet a target of £70 million) - and that whilst Newham faces a total of £75.5m of grant cuts over the next 4 years, it plans to go much further than the restrictions imposed by central government and make cuts totalling £116 million. Let's be absolutely clear - the Great Helmsman is far from the avid opponent of cuts in the public sector that he is pretending to be to his Labour Party friends. Instead, he is cynically using the appalling decisions of the coalition government as a smokescreen, one designed to hide his own indifference towards actively defending vital local services. "It’s naïve of me to expect some honesty about spending policy", says the Mayor. It would be naïve of the rest of us to expect the same from Newham council. Having reported that the council had failed to provide spending data in the mandatory format, I'm pleased to see that finally a CSV file is now available. What I'm struggling to understand is how Newham managed to hand over £1,276,615 during the last year to recruitment consultants Badenoch & Clark, at a time the Mayor is apparently so concerned about the impact of ConDem cuts. Remember the "Beyond Petroleum" campaign (above), which oil giant BP invested in heavily over much of the last decade and that was praised by the business press? Its advertising portrayed itself as a socially conscious company, one that cared about global warming and its link to energy use. 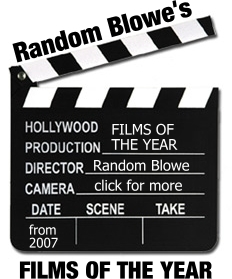 It suggested that BP intended to position itself at the forefront of investment in renewable technologies and, in the words of its American Marketing Association Effie Gold award in 2007, "wanted to be different". It was always greenwash of course - what BP really meant by 'clean' energy was natural gas. It was what Corp Watch described as "perhaps the ultimate co-optation of environmentalists' language and message". But following last year's Deepwater Horizon disaster in the Gulf of Mexico, BP has finally abandoned any last pretence behind its long-running adverts. Today the company recorded a full-year loss of £3.1bn to December 31, compared with profits of £8.7bn in 2009. In response, chief executive Bob Dudley has said in a statement that "BP intends to increase significantly its investment in exploration and to focus its upstream business on significant opportunities in key oil and gas basins" This will involve "licences to gain new access in basins worldwide including Brazil, the South China Sea, Indonesia, Azerbaijan, the UK and... Australia and, subject to government approvals, Angola"
In other words, the company is going all out to make its shareholders more money by drilling for fossil fuels, including more high risk deep-water oil exploration. So much for becoming a company that "wanted to be different". So much for moving 'beyond' petroleum. 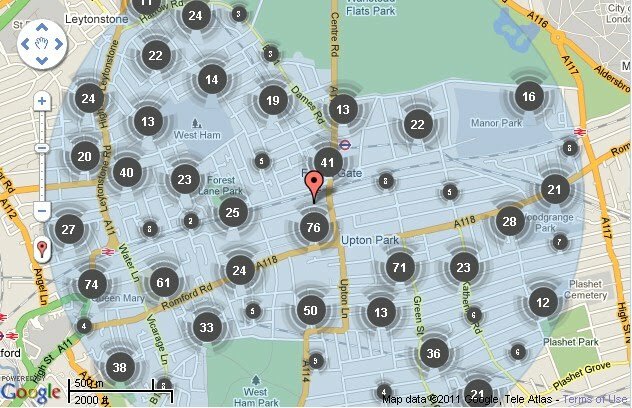 Interesting stuff - I've been playing around with the new Police.UK website, which provides hyper-local information on crime and anti-social behaviour reports at a neighbourhood level. The website shows that in December 2010, Green Street East ward had a higher level of crime and anti-social behaviour than Forest Gate and both were much higher than Stratford, which is something of a surprise. It also gives the details of the police's 'impossible to get hold of' local Safer Neighbourhood Team (SNT), should you prefer vague reassurance and inaction to finding out who actually burgled your house or smashed up your car. How this information is actually useful, however, is unclear. Local people have almost no say in local policing except through the aforementioned SNTs and my experience is that these are a waste of time - at best involving lots of effort for no long-term impact. I spend several years talking to the local officers in my area and repeatedly reporting every incident on my street but it has never stopping the dealers from selling drugs in the entrance of my home. Instead, I found it was taking over my life, causing more and more worry and stress, without ever finding a genuine solution. I never once heard, for example, that talking to an SNT officer led to an arrest for the vandalism, graffiti or anti-social behaviour that my neighbours and I suffered. An interesting lunchtime distraction, then - but I suspect Police.UK will have limited value in actually holding the police to account. UPDATE - The wonderfully named Conrad Quilty-Harper in the Telegraph isn't impressed either - he points out that the site does not include information on how many crimes are still unsolved, there is no live data (its updated monthly) and 'other crimes' includes "everything from drug dealing to bank robberies in one handy, impossible to understand category". He suggests that a spreadsheet would be cheaper and more useful - although as we know, there is a certain reluctance amongst public bodies to release data in an accessible format. UPDATE 2 - and this afternoon, the website crashed. Impressive.